DELISLE - La hollande divisée en ses IX. Départemens d'apres sa réunion a la France, avec les départemens limitrophes. . .
DELISLE, G ./ BUACHE, Ph. / DEZAUCHE, J. - La hollande divisée en ses IX. Départemens d'apres sa réunion a la France, avec les départemens limitrophes. . .
La hollande divisée en ses IX. Départemens d'apres sa réunion a la France, avec les départemens limitrophes. . . - DELISLE, G ./ BUACHE, Ph. / DEZAUCHE, J. Title : La hollande divisée en ses IX. Départemens d'apres sa réunion a la France, avec les départemens limitrophes. . .. Size : 18.7 x 23.6 inches. / 47.5 x 60.0 cm. 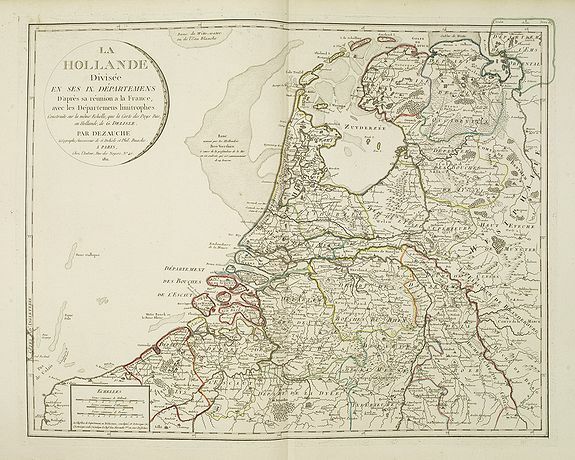 Description :Very interesting map of the present-day Netherlands shown in 1811. During the period 1810 to 1813 the Low Countries were annexed by Napoleon to the French Empire and actually incorporated into France. The country was split up in départments : Holland was divided into the départements Zuyderzée and Bouches-de-la-Meuse. After 1813, Holland was restored the United Kingdom of the Netherlands. One of the most important changes during occupation was the introduction of the civil register and exists basically unchanged until the present day. Since 1811, marriages have to take place before the magistrate, and for each marriage, an act of marriage is written into a marriage register. All births and deaths have to be reported within three working days, and acts are written into the relevant registers.